Located in eastern Nunavut, Baffin Island is the largest in the Canadian Arctic Archipelago and the fifth largest island in the world with an area of 507,451 sq km (195,927 sq mi). Almost connected to the Melville Peninsula, the island is separated from the continent by the Foxe Channel and the Gulf of Boothia, from northern Québec by the Hudson Strait, and from Greenland by Baffin Bay. Baffin Island is part of the Canadian Shield, an old erosion surface of Precambrian rocks. The southwest coast and inland comprises the Koukdjuak Great Plain, part of the Arctic lowland. Lakes Nettilling and Amadjuak, the largest lakes of Baffin Island, lie on this plain. Lake Nettilling is the largest lake in the Canadian Arctic Archipelago and the tenth largest lake in Canada (5066 sq km or 2140 sq mi). The northeastern coast is mountainous and framed by numerous fjords, inlets, cliffs, eroded sandstone valleys, and intricate alpine glaciers flowing to the sea. Active erosion from ice and water creates moraines, hoodoos (towers of erosion-resistant rock), sharp mountain ridges, and peaks. Hundreds of small islands surround the coast, especially on the southeastern coast around Cumberland, Hall Meta Incognita, and Fox Peninsula. Baffin Island possesses two major ice caps. The Barnes Ice Cap in the center north of the island and the Penny Ice Cap in the Cumberland Peninsula are about equal in size, 5935 and 5960 sq km (2292 and 2301 sq mi), respectively. Vegetation is diverse but sparse and dwarfed. Sedges, saxifrages, dryas, Arctic willows, cottongrass, broad-leafed willows, herbs, and Arctic poppies are some of the most common plants of the 350 species recorded on the island. From open water in summer, new ice builds in fall, invades the island for winter, and gradually moves away in early summer with the help of powerful currents and the world's highest tides (11.6 m or 38 ft on the south coast). 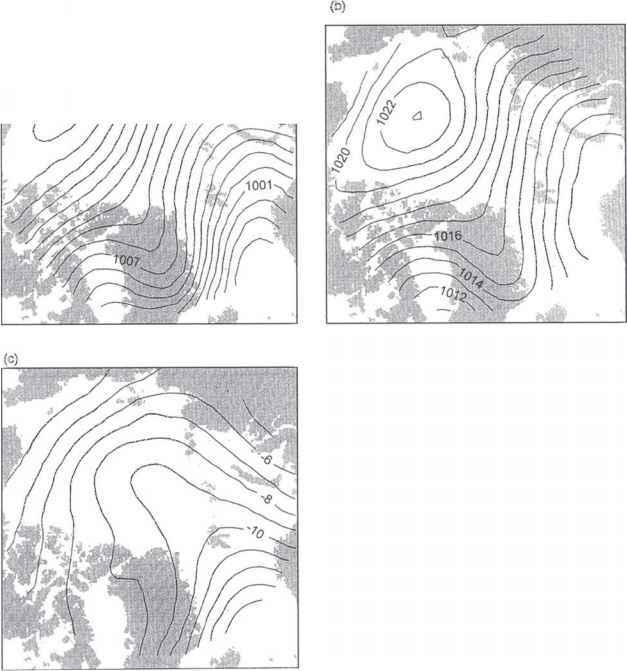 There is continual summer daylight and winter darkness in the north, but in the south, summer nights and winter days are about 5 h each. Iqaluit's temperature in January ranges between -28°C and -39°C (-18°F and -38°F) and 4-12°C (39-54°F) in July (Environment Canada). The average annual precipitation on the island is 424 mm (Environment Canada). Between Devon and Baffin Island, Lancaster Sound is the eastern entrance of the North West Passage, and one of the richest marine areas in the Arctic Ocean. Seals (bearded, ringed, harp, hooded, harbor), walrus, and whales (beluga, narwhal, orca, bowheads) are common in the Sirmilik National Park. The essential food source for all these species is the abundant and diversified marine life (fish, plankton, algae) and the presence of polynyas (open, unfrozen water in winter pack ice) in Lancaster Sound and Baffin Bay. The Sirmilik National Park, officially opened in 1999, covers 22,000 sq km (8494 sq mi) and includes the Borden Peninsula, Bylot Island, and upland surrounding Oliver Sound. Caribou, wolf, Arctic fox, lemming, Arctic hare, and polar bear are the most common land mammals in the park. Over 70 bird species (of which more than 40 breed in the park), such as murres, kittiwakes, snow geese, knot, ringed plovers, sandpipers, peregrine falcons, and hawks, have been recorded on the territory. The Auyuittuq National Park, in the Cumberland Peninsula, is the second largest of Baffin's national parks with 19,500 sq km (7529 sq mi). The other parks in the island are the National Wildlife Area at Qaqalluit (Cape Searle) and Akpait (Reid Bay), Kekerten Territorial Park (Cumberland Sound), Sylvia Grinnell Territorial Park, Katannilik Territorial Park, and Katannilik Territorial Park (Cape Dorset). The Dewey Soper Migratory Bird Sanctuary west of Nettilling Lake is designated as a wetland of international importance under the Ramsar Convention, and covers a 250 km intertidal strip of the Koukdjuak Great Plain. The largest breeding colony of snow geese (Anser c. caerulescens) in the world is found here. About 10,000 years ago, ice entirely covered Baffin Island. The ice sheet began to clear from the Gulf of Boothia and Hudson Strait 1000 years later, and from the Foxe Basin about 7000 years ago. The island was released from the ice 5000 years ago, leaving only an ice sheet between the actual Barnes Ice Cap and Penny Ice Cap. 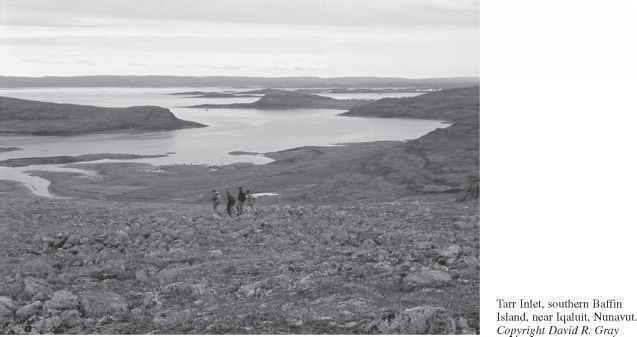 According to archaeological evidence found in Lake Harbour, Frobisher Bay, and Pond Inlet, the first humans on the island, the Paleo-Eskimos, colonized the island in approximately 2000 BC. Southwestern Baffin Island is considered, with Melville Peninsula, Southampton Island, and the extreme north of Québec, to be part of the core area of Pre-Dorset and Dorset Culture development. Dorset Culture sites were principally found in the Sirmilik Park, Foxe Peninsula, Cape Dorset, Lake Harbour, and Frobisher Bay. The ancestors of the present-day Inuit, the Thule, arrived after AD 1000 and became established in most parts of the island. The Norse possibly explored the northeastern coast, but there is no proof of their presence. Martin Frobisher landed in Frobisher Bay and was the first official European to explore the island during his search for the North West Passage in 1577-1578. In 1585-1587, John Davis navigated the Davis Strait and entered Cumberland Sound. Robert Bylot and William Baffin (who gave his name to the island) followed the northeastern coast in 1616 and entered Lancaster Sound. Finally, James Clark Ross skirted the entire northeastern coast and entered Prince Regent Inlet in 1848. Two Inuit groups are known to have occupied the island, and although they shared a similar dialect they considered themselves historically distinctive. The Iglulik occupied northern Baffin Island, adjacent islands, and Melville Peninsula while the Baffinland Eskimo (Nunatsirqmuit) lived in the island's middle-south. Since the 1950s, all the inhabitants of the island have been grouped in small towns or villages. Iqaluit, situated at the tip of Frobisher Bay, near the Becher Peninsula, is the main agglomeration and capital of Nunavut. This former American airbase has become an influential administrative center of over 4000 people with an important airport and necessary facilities. It was given city status in April 2001. Some of the greatest Inuit leaders come from Iqaluit. The island's population comprises over 10,200 people with an Inuit majority of 8000. Nanisivik, where lead and zinc mining is conducted, is the only village where Inuit are a minority (16% Inuit out of 287). Inuktitut and English are the primary languages, with about 400 French speakers in Iqaluit. Pangnirtung, Pond Inlet (Mittimatalik), and Cape Dorset (Kingait) are the other major villages with approximately 1000 people each (Statistic Canada: Census 1996). Roman Catholic and Anglican missions are present. The Canadian and Nunavut government and local town halls are the chief employers. Tourism, mining, handicraft arts, fishing, and hunting are other economic activities in the area. What is the climate like in baffin island?